The Oxford Treehouse Gallery is giving Lafayette County and Oxford residents the opportunity to celebrate, remember and memorialize passed loved ones for the Day of the Dead at 6 p.m. today. For Mike Mossing, who plans on attending the event, celebrating life is exactly what the holiday is all about. Participating in the Day of the Dead tradition with his daughter after losing his wife to cancer almost four years ago, the commemorative nature of the event has stayed with him. 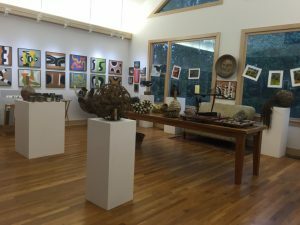 Nestled in the woods out in Lafayette County, the cozy little gallery features pieces from around 20 different artists. With the entire back half of the gallery looking out at the woods surrounding the property, to comfy couches to sit on and visit while admiring the art, the gallery has a welcoming feel that makes visitors think of home and family. It is Oxford Treehouse Gallery’s uniqueness and unconventional nature that makes it the perfect location for a Day of the Dead celebration. Not following any pattern or theme, the gallery is filled with various works of art from paintings of landscapes and sculptures of animals to pottery and even jewelry. Curtis, along with gallery owners Vivian and Walter Neill, said she is excited to celebrate Day of the Dead because she does not recall a similar event happening in Oxford before this. The gallery aims to create a space for the community to gather and celebrate the positive things in life while being surrounded by beauty. Curtis said they did a lot of research for the event trying not to veer into cultural appropriation by mistake. Wanting to make the event as friendly and comfortable for everyone as possible, while still following the traditions of the holiday, they decided to include an altar for departed loved ones. According to NPR, the Day of the Dead or Dia de los Muertos, was started 3,000 years by the Aztecs to celebrate passed loved ones rather than grieve for them. Celebrating the souls’ return to the living once a year, the tradition of altars was created, which welcomed passed spirits into the home. The altar at the gallery will follow tradition with items such as prayer candles, flowers, bread, water and salt as well as personal items including photos, mementos and written notes brought by participants to represent their loved ones. For Curtis, the items people bring are remembrances of those that have passed and are a way of finding peace with the ideas of life and death. At sundown, a list of passed loved one’s names, which can be added to on the gallery’s website, will be read with the hope that the person honoring them will step forward to show their connection with that individual. Since sharing food is at the root of many family gatherings, participants are also encouraged to bring the favorite foods of the departed friend or family member they are honoring for a communal potluck. The idea behind everything at the event is that all who come will be able to collectively share in the memory of those who have departed. Wayne Andrews, who has worked with the Oxford Treehouse Gallery in the past, felt the way the gallery is handling the holiday is more in line with the traditions surrounding the Day of the Dead rather than the usual flashy pop culture representation Americans are used to seeing.